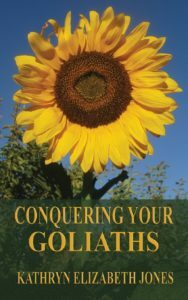 Conquering Your Goliaths by Kathryn Jones is a wonderful contemporary Christian novel. I absolutely loved it. The words penetrated my soul. It was beautiful and heart-felt. The story has life lessons for us all to learn. We all need the five stones presented in the story. We all need to know God. We need to cease our busyness and turn to God. “It was easy to forget God in the world of business and busyness.” We all need to make room for God in our lives. Prayer is a two way conversation with God. “She’d… expected God to help her without even a thought to listening to what He had to say.” Prayer is not us asking God for things, we need to listen to His answers. Prayer must be from the heart and not just us paying lip service to God. “She’d prayed… a quick dose method.” Prayer is never meant to be a chore but an act of love. The novel explores the need for a simple trust in God. “I needed to go forward in faith, not seeing… but knowing You stood there waiting for me.” God has promised to never leave us. We need to trust His word. We are all blessed and loved by God. ” ‘What made him beloved? What did he do?’… ‘Nothing. He’s my son.’ ” God’s character is to love. It is in his nature to love us. We do nothing to deserve His love but He loves us because of who He is and not for anything we have done. 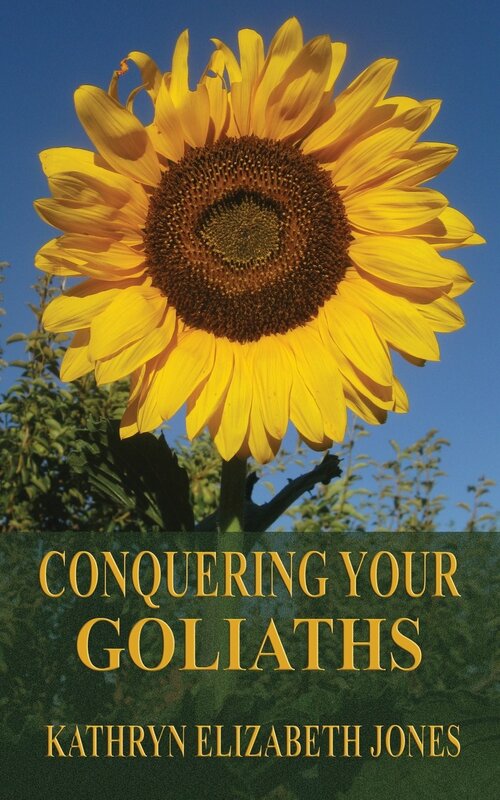 Conquering Your Goliaths is a book of great beauty. It is a book that will bring peace to your soul. It will enlarge your faith if you put into practice its words. Let the words sink into your soul and let God love you with an everlasting love. Thank you so much, Julia, for your review. Conquering Your Goliaths began with a simple request from my husband. He had received an email from a family member and this family member was intrigued by the five stones David gathered to defeat Goliath. Wouldn’t that make a great book? he asked. I got busy right away. Names for the first three stones came easily. The last two didn’t. As I prayed to know what the last two stones should be the answer came. I was in church. I reached inside my purse, searching for a piece of paper and wrote the last two stone names down. I thought this book would be a stand alone book, until one day I received the title of the second book in the series, “The Feast: A Parable of the Ring.” And then, close to finishing that book, wouldn’t you know it, the title for the final book came to me: “The Gift: A Parable of the Key.” Thank you again, Julia, for reviewing and spotlighting my book on your blog.